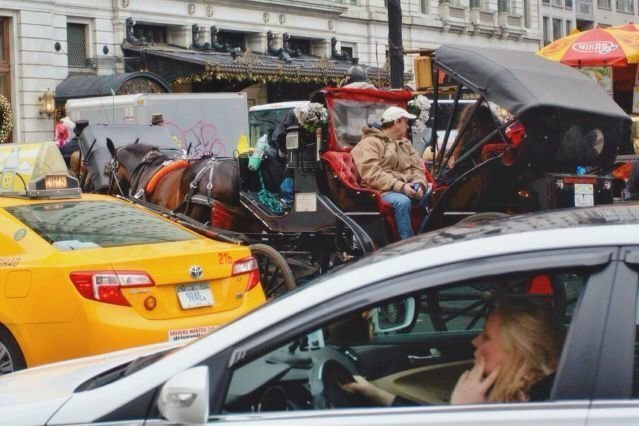 For many years, the Coalition to Ban Horse-Drawn Carriages has advocated for the New York City carriage horse - that poor creature who is forced to work a nine-hour day, seven-day week in all kinds of weather, regardless of what the law says. The New York City carriage horse lives in a small stall, which, although legal, is only half the size experts recommend. This cramped stall is accessed by a steep ramp, because the horses are kept on the upper floors of multistory industrial buildings. There is no access to pasture here, because it does not exist. 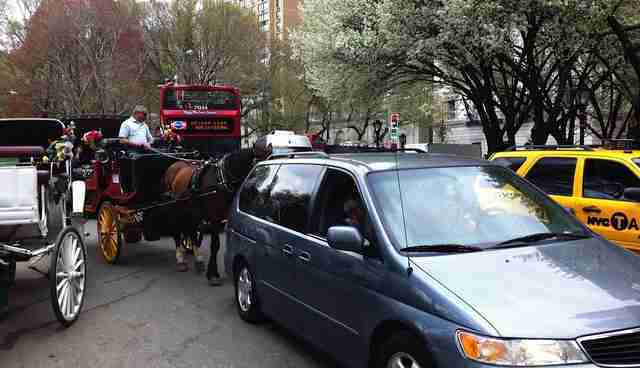 The much-beleaguered horse spends his day in heavy traffic congestion on the street or people congestion in Central Park. 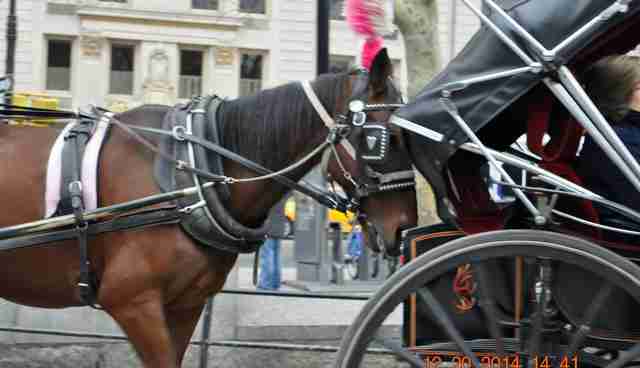 He is not a work horse but an "entertainment" horse being exploited by the owners to give joyrides and use Manhattan as an amusement park. We have been fighting to close down this inhumane, unsafe and frivolous business since 2006. We want to be proud to live in New York City. These horses, who have been referred to as "product" by supporter and actor Danny Glover, are given the bare minimum. Unlike Liam Neeson, who claims the drivers "love" their horses, Glover states it a bit differently: "I think people need to come by to see the product themselves." By inadvertently revealing more honesty in that twelve-word sentence than anyone has to date, we learn that this is the way the drivers really feel about their horses. They are products, merchandise. When they get tired and break down like an overused electronic device, they are disposed of - often sent to the auctions. Any industry that treats its "product" like this is also not going to treat its workers well. Propaganda - you are being lied to. The propaganda put out by the Daily News, NY1, Fox News, PIX 11, New York Post and others about the carriage horse issue rivals Communist China under Chairman Mao. The truth is not welcome. These media sources sometimes include a letter-to-the-editor or two, or add a comment by someone who does not agree with them within their articles or TV "news" pieces. But, clearly it is not objective and should shame any real journalist involved in this line of work. Propaganda is a form of communication - information that is not impartial and used primarily to influence an audience and further an agenda, often by presenting facts selectively (perhaps lying by omission) to encourage a particular synthesis, or using loaded messages to produce an emotional rather than a rational response to the information presented. This perfectly describes the reporting by the New York Daily News. In obvious agreement with the Teamsters, the Daily News repeatedly has described the drivers' jobs as "good union jobs" and, as early as the fall of 2013, claimed all the horses would go to slaughter if there were a ban. The Daily News even started a branded campaign and a petition to save the New York City carriage horse trade. What kind of professional newspaper does this kind of thing? "Why?" is the question everyone, including the City Council, should be asking. What is going on behind the scenes at the Daily News and the Teamsters, with the support of the Cavalry Group - a right-wing lobby group that promotes itself as fighting "radical animal rights extremists" and supports puppy mills and horse slaughter? Who has the power to investigate this cabal for its lies in trying to manipulate, bully, control public policy and bring down the mayor of the biggest city in the US? We know the horses do not get treated right in this abusive, exploitative industry - from working conditions, to living conditions, to what happens to them when they are no longer wanted. All based on information that is out there for anyone to see. But what about the workers in this business? First, it is important to understand that there are the owners who own the 68 medallions - the license needed to operate a carriage - and there are the drivers or workers. Some owners also drive carriages. Not surprisingly, some of the owners have other lucrative business operations, such as restaurants, and a few own multiple profitable medallions. Is it because the workers (i.e., the drivers) feel they cannot get anything else that they stay? Have they been beaten down by the owners? The mayor's office has offered customized, extensive job training and green taxi licenses to all of them. They could have the opportunity to segue into another business - very possibly a real union business - and get great benefits: sick pay, vacation pay, health benefits and pensions. Why don't drivers take the chance - leave "The Infamous 68" to fend for themselves in their cash-only business? As it stands now, the workers do not receive health insurance benefits. Some are on Medicaid. Most, if not all, are "independent contractors" not "employees." Because they are not employees, they are not even eligible for sick pay under the city's new "paid sick leave" law. When one driver had an accident and ended up hospitalized in a coma a few years ago, there was a collection to pay his medical bills. Of these, approximately 68 own the medallions. Several of those licensed to drive a carriage are not actively working; some are living in other countries or working in other states but keep a license to pad the rolls for the owners. The Teamster "carriage driver local" claims only 120 members according to Teamster Demos Demopoulus reported in City & State. The Teamsters and many in the media have led the public to believe that a ban will put these poor working class people out of work - giving up good union jobs. But the union does not provide benefits to the members in this local because it is not a "union shop." Fewer than half the drivers are "members." There is no Collective Bargaining Agreement. This means that they do not get health care, vacation and sick days or pensions, to name some of the common benefits that real union jobs provide. An independent contractor gets a 1099 form to file with the IRS. The employer does not withhold any taxes - it is up to the worker to address this. This means that no income tax, social security taxes, workers' comp or unemployment insurance deductions are made. This is a cash-only business with no documentation for the exact amount of money involved. This should offend real union aficionados and labor supporters because it is not a real union. You have been lied to by the Teamsters, Working Families Party and Central Labor Council. Instead of helping to create real substantial union jobs for the workers, they are propping up the 68 owners in this cash-only business. The AFL-CIO reports on the benefits of being a union worker. On average, union workers are more likely to enjoy better benefits compared with non-union employees. That includes health insurance, retirement accounts and paid sick leave. According to the US Department of Labor, 77 percent of union workers get pensions (guaranteed continued payments) after they retire from the job, compared with only 20 percent of non-union workers. Again, union representatives work out these details as a part of the collective bargaining agreement with the employer. 92 percent of union workers have job-related health coverage versus 68 percent of non-union workers. Take a look at what an authentic Teamster job provides, or this. The guise of the New York City carriage trade's being a "union shop" is simply a ploy to prop up the 68 private owners - nothing more. It is a disgrace. People who care about human social justice issues should be protesting the carriage trade and the Teamsters for perpetuating worker abuse. Those who practice inhumanity to one species often show it to all species.